Spring has finally sprung in NYC and this calls for a celebration. Come have a drink (or two!) 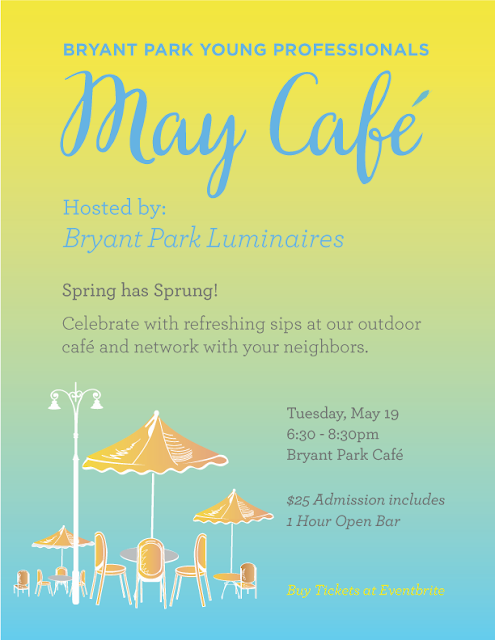 with the Bryant Park Luminaires at the outdoor cafe, socialize with new and old friends, and participate in our Meet and Greet Scavenger Hunt. What comes with admission? A fun little scavenger hunt to get to know other Young Professionals. If that isn’t enough to draw you in, the hour long Open Bar might. Where is this happening? The Bryant Park Café. Enjoy drinks outside, with a nice view of the lawn... and a little people watching. When does this take place? Tuesday, May 19; 6:30pm - 8:30pm. Why should you come? Because who doesn't like meeting new people and enjoying a drink outdoors in springtime? The Bryant Park Luminaires is a membership-based organization for young professionals, 21-35, who work around, live near, or have professional ties to Bryant Park. Bright, connected, and committed, the Luminaires represent the best of New York and are entitled to privileges at park related events and special networking opportunities in affiliation with their connection to Bryant Park.